What am I doing wrong when making lap joints with my stacked dado set? I'm trying to cut some lap joints on a table saw using my stacked dado set. But the depth of the cut is inconsistent from pass to pass. It seems like I'm getting somewhere between 1/32" to 1/16" variation on each pass; it's difficult to tell for sure because the depth of the cut is potentially variable on each pass. What could be causing this inconsistency? Perhaps the saw blade is actually oscillating up and down as it makes the cuts. Is this a thing that happens in table saws sometimes? If so, what do I do to fix it? Maybe the wood is actually riding up over the blade? That doesn't make a lot of sense to me, as that is more like what happens in a climbing cut. I tried several things to get a more consistent joint, including making sure the pressure was as even as I could get it on each pass, and it helped a little but still had a lot of variation between passes. Maybe the board itself has inconsistencies in height, causing it to engage the cut at different angles? That doesn't make a lot of sense either, because the cuts seem fairly consistent through a single cut. They only seem to vary between cuts. But I did try planing the board before cutting the joint to see if that helped with consistency. It didn't seem to make any difference. Maybe my expectations are off and this is just what I should expect to get out of a stacked dado set? This seems to be a lot more variation than I can use as-is in a lap joint. If I were to glue it up like this, my gut tells me I'd be compromising the strength of the joint. Is this true? LeeG suggested that accumulating sawdust might be the problem. I made several changes to my setup, and it seems to have done the trick. I replaced the fence I'd been using with a much straighter board, and I cut a rabbet at its base for dust relief. I made sure to keep the surface of the table saw as free from sawdust as I could between each pass. The changes seem to have worked. The cuts are much more consistent between passes now. The chippers in the stack may vary in height. You can test for that by making a single pass and see if it is smooth. If the chippers are ok, then it is likely technique. Make sure you are holding the work piece down tightly against the table on each pass and make sure there is no sawdust accumulating under it. If you have some uneven joints, you can clean them up by sliding the work piece side to side over the blade. This will help remove the high spots. You can also clean it up with a hand plane. You can eliminate the entire problem by using a tenoning jig and making the cuts vertical. There is a good chance it is technique. You need to keep the piece flat near the saw blades. A little rocking action and each pass will be different. having the board flat from the beginning helps, they can easily have a warp which can affect the depth of cut. A slight bow or cup can make a difference too. If there is cupping flat on one side brings the other side up and also allows for rocking. So keeping the board flat to the table nearest the blade is good and as LeeG said, running it back and forth afterward can even out the cuts. My dado stack gives me the exact same results. Depending on the manufacturer of your dado stack it is likely due to the design of the dado stack. Direct quote from the literature that came with my dado stack: "This dado has been designed with beveled outside blade teeth. This means that the outside saws will cut the very outer edges slightly deeper than the chippers. This minimizes tear-out and gives an overall better cut." This also means if I make multiple passes to create a large rabbet then I will have inconsistent depth cuts across the rabbet or tenon. I also performed 3 tests with 3 different blades cutting rabbet on the end of a milled piece of Douglas fir. These tests show how the type of blade affects the smoothness in the rabbet. The second lap cut was made with a Freud 40 tooth alternate top bevel (ATB) general purpose saw blade. The details of that blade are available here: http://www.freudtools.com/index.php/products/product/P410. This blade yields results far worse than the dado stack because the bevel is more severe. The last lap cut was created with a LM72M010 Freud 24T flat top grind (FTG) rip blade. The FTG should result in the smoothest / most consistent lap because of the grind. I can't post a link to the saw blade because I don't have the required reputation. 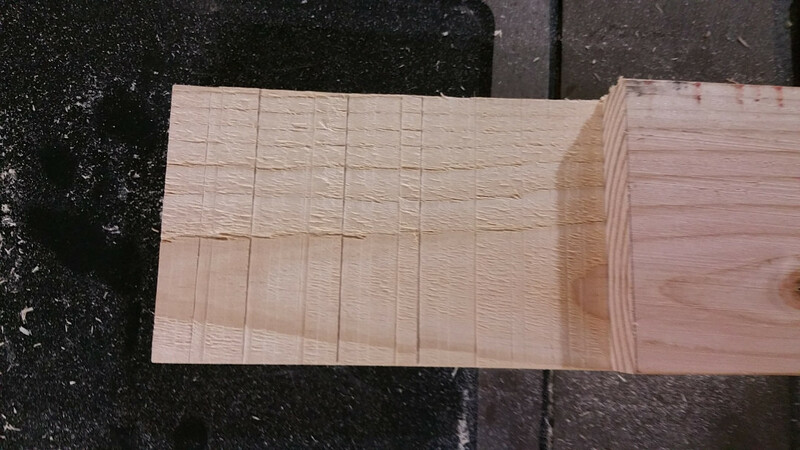 When I cut rabbets, tenons, or multi pass dados using my dado stack my results are similar to your results. It is due to the bevel on my dado stack. For most applications the slight variation in depth doesn't matter. 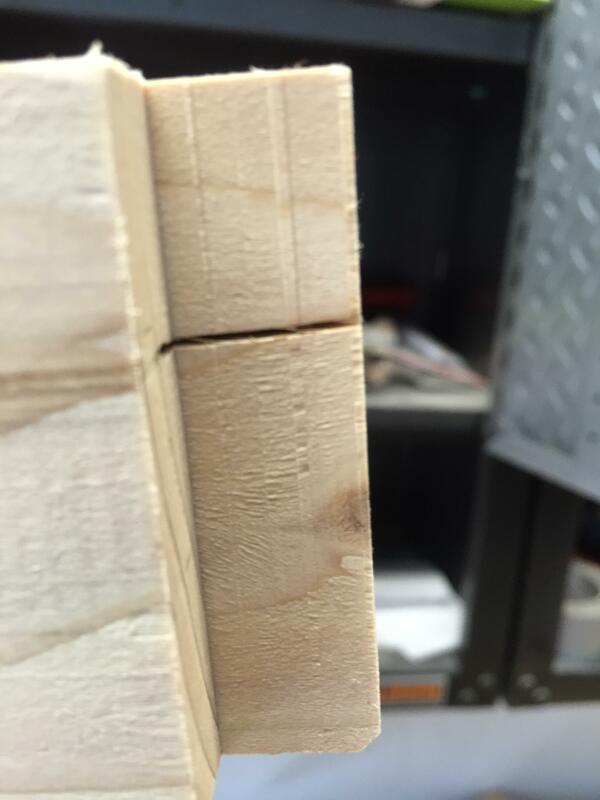 The dado stack results in nice clean and flat dados when a cut doesn't require multiple passes. If I really need a nice smooth tenon, rabbet, or dado then I will use my saw blade with the flat top grind which as you can see from the picture above results in the smoothest rabbet. I don't think this is a problem, and it seems unlikely that you'd compromise any strength because the wood glue will fill over the variations in depth. I think it is probably how your dado stack was designed, but you'll have to check for yourself. 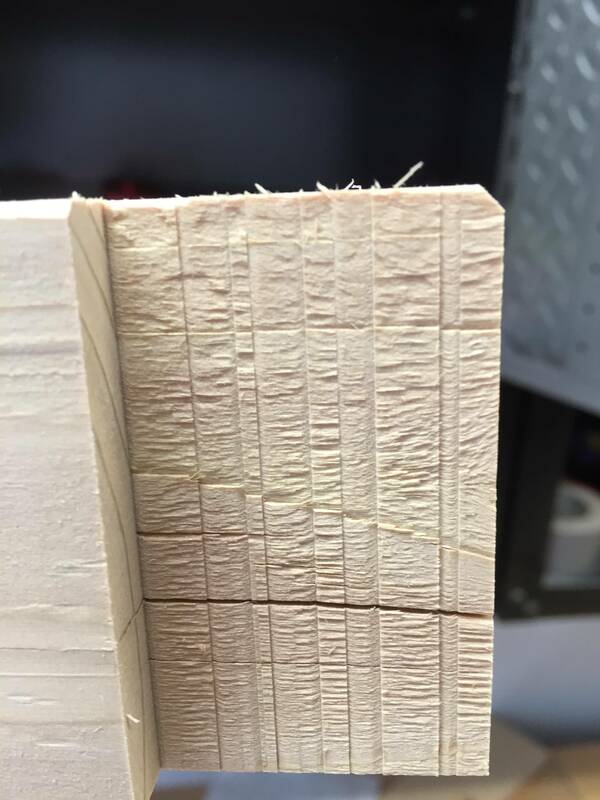 If it is caused by number 2 then you could buy a dado stack with a flat top grind or use a single blade with an FTG to make your cuts when you need smooth rabbets, dados, or tenons. Or you could sand / plane out the depth variations. I can't help with the diagnosis I'm afraid, I have no experience with dado stacks and they're actually not permitted in Europe so that's not going to change any time soon! But your question #1 is relevant to an important issue in woodworking about joint surfaces and proper bond formation, and the point I build towards provides a solution that allows you to continue in the absence of a diagnosis or workable fix. Generally speaking you're right to be hesitant. In wood, the ideal glueing surface in a joint of this nature is both very flat and very smooth. The goal being to bring these two flat surfaces into intimate contact, with a very thin and uniform layer of glue between them; hence why smooth is good. And literally the thinner the glue line the stronger the joint. Even slight texture from sawing is enough to interfere with this process. However I must stress that this is in relation to the strongest possible glue joint, and while this is something to aim for it is often not actually needed. Sometimes strong enough is good enough. In a piece of furniture, the overall structure and the other fixed joints function together to support weaker joints within the piece. In fact in some furniture one or more joints could be left unglued, and the structure of the piece — locked together by the rest of the glued joints — will not allow those joints to come apart under normal circumstances (although there will be more movement than there would be otherwise). 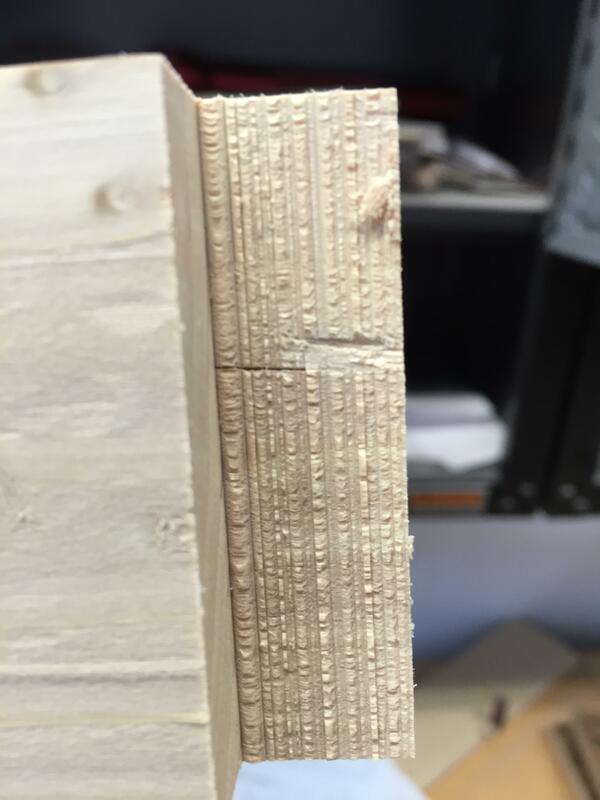 Now taking into consideration that you say initially that there can be as much as 1/16" variation you might want to err on the side of caution and choose a gap-filling adhesive. The simplest recommendation is epoxy. Epoxies can be expensive, but in my experience even the cheapest type that you might find in a dollar store (UK, pound shop) can work perfectly well, as long as the short working time of approximately 2-3 minutes is acceptable. In addition to their ability to form strong bonds where there are significant gaps, another advantage of epoxies is that they don't require firm clamp pressure (which conventional wood glues do, to create that very thin glue line). So for a lap joint like this a single spring clamp to hold the pieces together where they overlap would be sufficient. Have you compared the holes in the center of each blade? If the spindle on the saw is not level or is bent or the threads or washer are worn, that could be the source of the roughness. Not the answer you're looking for? Browse other questions tagged joinery table-saw dado or ask your own question. Is it sensible to use a router for cutting large dados? What is the difference between a $40 dado blade set and a $240 dado blade set … besides the price? How to setup joint proportions? How do I use a cross-cut sled safely? How can I cut a partial groove in the center of a piece of wood without going through the ends? Edge joint failure - what is the cause?